Handheld pocket-sized Ethernet network test tool w/ Wi-Fi connect. 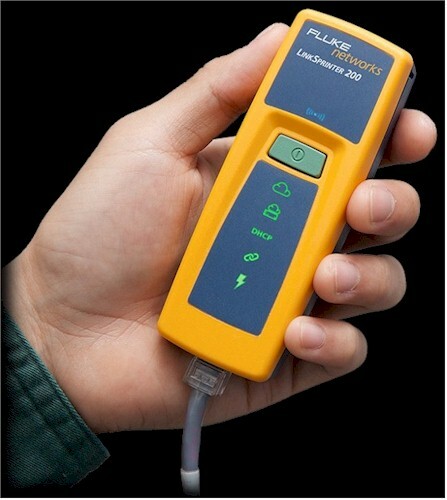 Fluke Networks, a division of Fluke Corporation, recently announced the LinkSprinter 100 and 200 Ethernet test devices. You're probably familiar with the Fluke name; their website lists them as "the world leader in the manufacture, distribution and service of electronic tests tools and software." Personally, I've had good experience using Fluke products. I have an older Fluke 77 Multimeter that comes in handy when I'm trying to replace an outlet or light fixture and not electrocute myself. The LinkSprinter 100 and 200 are small handheld Ethernet test instruments, designed to simplify troubleshooting network wiring and connectivity. The 100 and 200 are nearly identical, with the 200 having the additional ability to wirelessly communicate (via Wi-Fi) with any device that supports a web browser. Note, the LinkSprinter 200 is a wired Ethernet test tool, not a Wi-Fi test tool. The LinkSprinter 100 and 200 are handheld devices and easily fit in a shirt or pants pocket. They measure approximately 4.5" long by 1.75" wide and 1.5" thick and weigh .25 lbs. Both are housed in a solid plastic case with the familiar bright yellow Fluke color. Fluke's specs list a shock rating indicating it can survive a 1m drop. I accidentally dropped it on a concrete floor and it wasn't damaged. There are six LEDs on the front of the LinkSprinter to display test status and results and no screen on the device. It has a single Ethernet port on the bottom of the unit that does not have link / activity lights. The LinkSprinter is powered by a pair of AA batteries, as well as via Power over Ethernet (PoE). All test results are communicated by LED, to the cloud, and in the case of the 200, wirelessly to a computer, smartphone, or tablet. The LEDs on the front of the device, from bottom to top, indicate whether PoE is present, if the link is active, whether a DHCP server is active, if there is connectivity to the gateway/router, and if there is connectivity to the cloud site. On the LinkSprinter 200, there is also a blue Wi-Fi LED that lights when Wi-Fi is enabled. Below is a photo with all the LEDs lit. There are a few simple steps you need to complete to get started with the LinkSprinter. First, install two AA batteries. Second, browse to the LinkSprinter website, create an account and enter your device's MAC address. Third, connect an Ethernet cable to the device and a live network with Internet connectivity. Finally, press and hold the main button for 5 seconds so it will connect to your account. Once complete, you're ready to test and use the device. The LinkSprinter has a few configuration options in a simple web-based menu. The LinkSprinter can be configured via the LinkSprinter Cloud Service as well as via a Wi-Fi connection. The configuration options include Test 1Gb, auto-off, cloud connectivity options, and Wi-Fi. The Test 1Gb option, when disabled, saves battery life, but limits the device to testing 10/100 speeds. Below is a screenshot of the website configuration options. I discovered when you make a change to the LinkSprinter config via the Cloud Service, the change doesn't seem to take effect until after another test is run. Whereas, changes made via the Wi-Fi connection appear to be effective immediately. The LinkSprinter is quite simple to operate since there is only one button on the device. Simply connect an Ethernet cable and press the button to initiate a test. Results are automatically transmitted to the LinkSprinter Cloud Service dashboard where you can log in and view them. Results are also sent to the email address you set up on your LinkSprinter account. Press the button on the LinkSprinter 200 a second time to enable Wi-Fi so results can be viewed on your PC, smart phone, or tablet.